The Iroquois originally lived near Lake Ontario and along the Mohawk River in New York State. Around 1600, five tribes -- the Mohawks, the Oneidas, the Onondagas, the Cayugas, and the Senecas -- banded together to form a confederacy. A sixth tribe, the Tuscaroras, joined in 1722. These people called themselves "Haudenosaunee" or "people of the long house". The name "Iroquois" is a French variant on a term for "snake" given these people by the Hurons. There were other tribes who spoke a similar language, but who were not part of the confederacy. For example, the Erie natives were related to the Iroquois. They lived along the eastern shores of Lake Erie in New York and Pennsylvania. The Iroquois Confederacy considered them enemies and wiped out the entire tribe. By 1650, the Iroquois began to push their way into the rich Ohio Country between the Great Lakes and the Ohio River. They conquered and drove out various groups of Native Americans living in the area. The resulting wars were known as the Beaver Wars (1650-1700 A.D.) because the Iroquois wanted more land for hunting and trapping beaver and deer. The Iroquois participated in the fur trade with the Dutch and then with the English. Unlike many other tribes east of the Mississippi River, the Iroquois generally did not favor the French over the English. 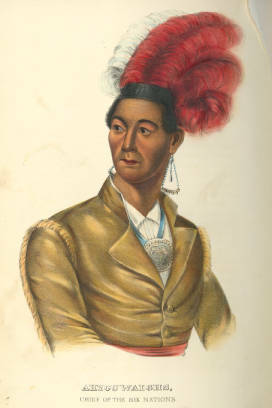 A small group of Mohawks and Onondagas converted to Catholicism and aided the French, but most of the Iroquois assisted the English against the French. During the American Revolution, many of the British-allied Iroquois joined with the British against the American colonists. A small number of the Iroquois lived in modern-day Ohio. Probably only several hundred Iroquois resided in Ohio at any one time. They came there primarily to hunt. Some Iroquois who remained in Ohio developed their own political system and separated themselves entirely from the Iroquois living in the East.